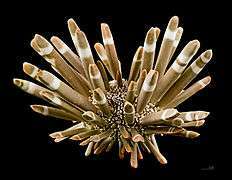 For other species with the same common name, see Slate pencil urchin. Heterocentrotus mamillatus, commonly known as the slate pencil urchin, red slate pencil urchin, or red pencil urchin, is a species of tropical sea urchin from the Indo-Pacific region. Radiols (spikes) of a "slate pencil sea urchin". They are a classical souvenir. 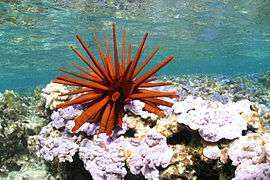 This species is a large sea urchin, with some specimens reaching over 8cm in diameter, with spikes up to 10cm. Most specimens are bright red, but brown and purple colorations are also seen. The spines may have a different color from the body. 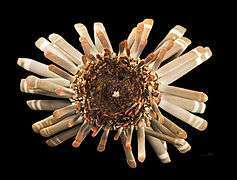 Spines have a white ring at their stem and have alternating light and dark rings. The spines are rounded to triangular in cross-section and taper towards the tip. Surprisingly during the night the red spines turn into a chalky pink. Specimens from Hawai‘i tend to have bright red spines, while specimens from other parts of the Pacific may have yellowish or brown spines. Heterocentrotus trigonarius is a similar species that has longer and darker spines, more angular, and is always monochromic. Red pencil urchin at French Frigate Shoals. This species can be found throughout the tropical waters of the Indo-Pacific region (from the east coast of Africa to the Pacific archipelagos), but is especially abundant in Hawai‘i. It is found in reefs in depths from eight to 25 meters. Hoover, John P. (1998). Hawaiʻi's Sea Creatures: A Guide to Hawaiʻi's Marine Invertebrates. Mutual Publishing. ISBN 1-56647-220-2. "Heterocentrotus mamillatus". Integrated Taxonomic Information System. Wikimedia Commons has media related to Heterocentrotus mamillatus.